You are here : Home > Informatics > How to heal cancers naturally? 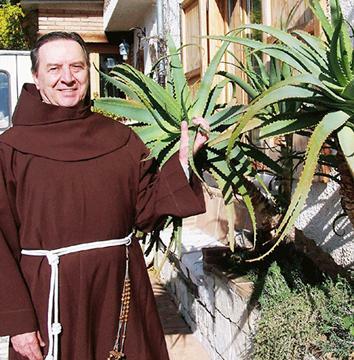 An article by Father Vittorio Boselle published in the Jerusalem magazine "Terre Sainte" in 1994 discussed a syrup with which Father Romano Zago had treated more than one cancer. 1 Wash the Aloe vera leaves and remove the thorns. Cut into pieces. 2 Put the Aloe vera pieces, the honey and whisky (or rum) in a blender or extractor. 3 Whisk for 2 to 3 minutes. A greenish syrup will be obtained. The amount of syrup obtained by the above quantities of the three elements constitutes a "processing unit". Keep the syrup refrigerated. Before drinking the syrup, shake the bottle to thoroughly mix the components. Take one spoonful (table spoon) of this syrup three times a day: mornings, noon and night, 30 minutes before meals. The above preparation can last about ten days. Don't stop taking the "processing unit" until it is totally used up (even if you get what seem to be signs of improvement). It's very important to do medical tests to ascertain the progress (or lack thereof) of the above treatment concerning the disease. It is specifically necessary to check before, during and after the treatment to know if the cancer still progresses, has been stabilized, diminishes, or has actually left. Only the results of such controls can determine the true state of the cancer, not the subjective feelings of improvement that might be felt by the cancer patients. In fact, it is commonly observed that this treatment quickly induces a certain sensation of well-being and improvement in the sick person. But those feelings don't constitute any proof that the cancer is truly cured. It is dangerous to let oneself be guided by any such sensations. As mentioned, medical monitoring is very important. If the first "round of treatment" does not work to satisfaction, the patient must do checkups to determine where s/he is at and whether s/he must do a second (or third) round. It would be ideal to make an initial analysis of the "amount" of cancer present before beginning the treatment, and another analysis after each "processing unit" has been taken. When taking several "processing units" in a row, it is necessary to keep an interval of TEN DAYS between the taking of one unit and the following due to the Aloe Vera (sábila) plant being somewhat toxic. With these intervals of ten days, repeated ingestion of "processing units" will do no harm. For this reason, in case the recommended medical tests cannot be done, one is in no any danger when repeating the treatment (even when unnecessary), as long as the 10-day "syrup-free" interval is respected. May be used simultaneously with conventional treatments such as chemotherapy or radiation. 1) The cancer continues growing, there is no sign of a cure. Take another unit of treatment. 2) After two processing units have been taken, the cancer continues growing. Double the dose, i.e. take the syrup as before in the morning, at noon and at night but this time, take two spoonfuls before each meal. Repeat this double dose until the cancer stops. 3) The cancer no longer grows and has effectively stopped: a good sign. Take another round of a normal "processing unit". ie take one spoonful again, morning, noon and night, before each meal. 4) The cancer diminishes: a very good sign. Undertake a new treatment round of ten days, and repeat it when necessary, until the cancer completely disappears. 5) The cancer has completely disappeared. Cases in which a single "processing unit" proves to be sufficient to eliminate the cancer are very frequent. In this case, you can do two things: cease the treatment for good, or take yet another round of "processing unit". Eat plenty of raw foods : Broccoli, sprouts, cauliflower, kale, garlic, beans, blueberries, onions, ginger, spirulina, chlorella, fresh fruits, etc. Avoid : Dairy products, refined sugar, artificial colouring, chemicals, sweeteners, white flour, red meat, processed meat, etc. You can take a "processing unit" even when you don't have any symptom of cancer, simply for PREVENTION. 0 Response to "How to heal cancers naturally?"